Many unexpected experiences happened. Entry and pictures (a lot of them!) - later. Next Monday - Pulau Pangkor! Yey! For more about what initiated this trip, read this. There's a reason why I mentioned about visiting "Terengganu" instead of visiting "Awana Kijal". The prize we won only mentioned 3-day 2-night stay, meaning that we can only stay; no breakfast. We have to cook by ourselves. Made it worse was that we didn’t really won the stay in a hotel room with luxurious conditions, thick comforting bed, a tub in the bathroom for us to drown in warm water-bath and all. No, we won something else, unexpected. Better not to mention more of that. Let’s put full stop here. This supposed to be a happy story, right? The journey took about 90 minutes from Kuantan to Kijal, Kemaman. There were 6 of us; Hafipah had to walk out from the trip since she got her sister to deliver her baby soon. We’re waiting for good news Pip! 2 boys and 4 girls with 2 cars joined the trip planning to fill the semester break with something nice, something unforgettable. Unfortunately, the first day we arrived, the rain fell really hardly like the day didn’t allow us to do any outdoor activities. Lucky me, it was a good condition for me to get rest and sleep; you know how tiring driving is. The rest, they got to find umbrella to walk and see the Laut China Selatan from private beach of Awana Kijal. Then in the night we went to a restaurant named Bahtera (yah I could see why it was named so) to have our dinner. Special for that night was Ikan belut. Yummy! I have tasted belut previously while in Bandung but this time the taste was different and the size was bigger. The way the belut was cooked also different and made it so delicious unlike other kinds of fish. The rest were the ordinary meals we have tried before. Move on to the second day, it started like usual. As planned, the girls went to the beach, having their private time there while the boys went to find breakfast. They ordered nasi dagang (o.. o.. nasi!) and we have to find it about 10km away from where we stayed! Can you imagine how far that was just to find breakfast meals? But me being me, I didn’t really mind. That’s just a small matter. After having dinner, we split. The girls stayed in the “hotel” while the boys went to meet some relatives. Nothing much was in the second day and night. Third day! This is the climax. We checked out at 12pm then we went to Kuala Terengganu! A journey of 2-hour from Kijal brought us right to the city where once we reached there, the floating mosque greeted us with smile and salam. The day was nice, no rain and a little bit hot. Just nice for a day trip! After meeting a friend, Fahmi who willed to be our tour guide for that day, we straightly went to Muzium Negeri Terengganu, the biggest museum in Malaysia. Basically I didn’t expect that Terengganu have such a huge museum – full of histories and artifacts ranging from animals to ships, keris to batik. But the best part was that, the building itself. The design and architecture, mesmerized me up to a point where I thought from any angle you take shots of picture around the museum, you won’t regret the result. And that’s where we ended the day and then we looked for low cost hotel for a-night stay. A RM40 room for the boys and a RM60 room for the girls; both equipped with TV, air-conditioner and so-so beds, just nice to accommodate a night stay-and-sleep. But wait, we didn’t spend the night with rest and rest all the time, but the tour guide brought us to a small kampong coffee house to try its – don’t laugh – mi magi! Basically, the meal was nice and me being me, I don’t really eat magi. Sorry Fahmi... ‘;p But thanks to your cousin for belanja-ing us the dinner. After that, we spent about an hour sitting next to the sea, seeing the development of Kuala Terengganu. 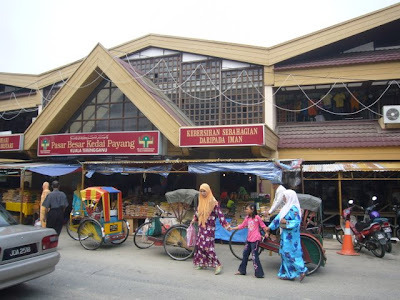 Having people of origin of Kuala Terengganu with us, they told us many things about the place – what this and what that. Fourth day. It’s time to shopping, I mean for the girls. We went to Pasar Payang (one of us called it Pasar Payung LOL) to look for gifts and foods. Again, me being me, I’m so-so about shopping, so I didn’t spend too much for 2 senyum-sokmo t-shirts, a pair of kain batik for you-know-who, keropok ikan and some other foods I have never found and tasted. Next, we went to Losong, where there are so many kampongs with the front name Kg. Losong so-and-so to buy keropok losong. Nothing much there because some of us have other plan to buy the no-difference-from-keropok-lekor foods. Then we moved to a place next to the beach named Batu Buruk for a sip of air batu campur before splitting from Fahmi and thanking him for guiding us when we were in Kuala Terengganu. Believe it or not, he slept with us (of course I mean with the boys) in the hotel instead of sleeping at home the night before! That’s so kind of you Fahmi. That’s where we ended the trip in Kuala Terengganu and then we headed to straightaway to Kuantan. On the way, we dropped by at Kuala Kemaman to look for the best keropok lekor and satar. For the first time, I tasted mi calong. I’ve never heard of it and to me the taste was delicious. Yummy! EEEEIIIIII!!! !ASYIK GI JALAN2 JE YEAKKKKK!!!!!! amboi cik Zaki, lepas Ganu Pangkor pulak. to be honest, I'm envy of you, y'know. ade duit, kaki pun bleh la melangkah. kalao tak, jadi katak bawah tempurung la.. syukur saya ade simpanan utk gi melancong ni..
kedah ade dalam perancangan, tapi later ah. tak tau bile nak gi rumah asmawi..
mine was meesy gak. tapi we just keep it for ourselves la. takyah nak kongsi2 dengan org sangat. kita cita yang best2 je.. nanti bila kita review entry ni balik, kita akan happy tanpa mngenangkan pengalaman yang tak berapa best tu.. let's take it that way ya?